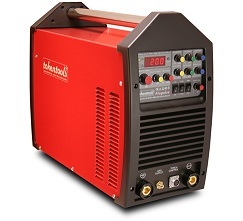 Inverter welding machines available for purchase from Tokentools.com.au with immediate shipping. Any inverter welder ordered and paid for before noon ships the same day. Visit the tokentools website, link adjacent —->>>> and find your new welding machine now. We stock Mig Tigs, Arc welders and Plasma cutters. You can buy the entire welding kit from the machine to the safety gear. Having specifications like MIG (GMAW/FCAW), Stick (MMAW), Lift TIG (GTAW) process, an input voltage supply of 240 volt AC +/-5%, 50Hz (15A plug) and current range from 5 to 1000 amps make our Tokentools welding machines the right industrial tool to use for all types of welding processes. Not only for inverter welders but for all types of our welders we offer our industry first and industry leading Five-Year Warranty, 30-Day Money Back offer. These excellent policies demonstrate the confidence in our quality and after selling in Australia for over a decade we are still around to prove our longevity. We never compromise on quality and provide overnight delivery between Melbourne and Brisbane. These are some of the important reasons that our customer base has been growing exponentially day after day. Our inverter welders come with genuine industry standard torches and accessories. You can buy spares and consumables from us or your local welding supplier. Call the Sydney office on 02 8014 1005 for friendly assistance by knowledgeable staff.